Billy Bragg & Wilco, "She Came Along to Me," lyrics by Woody Guthrie. Today is International Women's Day, and I'm marking it by posting a video of a song done by a bunch of guys. The lyrics were written by a man, Woody Guthrie, in 1945, and were set to music by English singer-songwriter Billy Bragg along with Jeff Tweedy and the late Jay Bennett of the Chicago based rock band Wilco. This was done as part of a project called Mermaid Avenue, organized by Guthrie's daughter, Nora. In an interview for the web site DVD Talk, Nora Guthrie described how work on her father's archives had led to finding a trove of lyrics that had not, to anyone's knowledge, ever been set to music. [T]here were just so many lyrics that I had never heard of and my family hadn't heard of. And don't ask me why they were never recorded, because I can only suppose why. I wasn't there so I don't know the real answer to that one. But anyway, I just started finding these great lyrics and they sounded, I mean just as a piece of written word poetry, I just loved them. And I started tacking them up on my tack board here. I thought "Hmm, someday I want to do something with this stuff." And then cut to the chase, I found Billy Bragg and asked him if he wanted to work on it. He kindly said, "Yes." The project was called "Mermaid Avenue" because the lyrics were written when Woody Guthrie and his wife lived on Mermaid Avenue in Coney Island, actually a peninsula projecting from, and part of, Brooklyn. (My immediately previous post is about Coney Island Brewing Company's "Mermaid Pilsner.") It resulted in three albums; "She Came Along to Me" is on the first, the cover (with photo of the house where the Guthries lived) of which is shown on the video above. 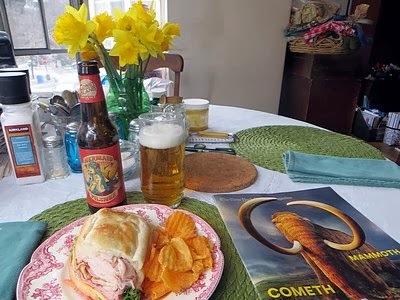 A couple of weeks ago I tried Coney Island Brewing Company's "Seas the Day" India Pale Lager. Now I've also had their Mermaid Pilsner. It's good beer. Pilsner (or Pilsener) is a style of lager--a lager being any beer made with bottom fermenting yeast--that originated in the city of Pilsen, or Plzeň, in what is now the Czech Republic. What distinguishes Pilsner from other lagers is that it is made with lighter colored malts, resulting in a golden, as opposed to a deep amber or brown, color. It usually also has a more pronounced hop flavor than other lagers. 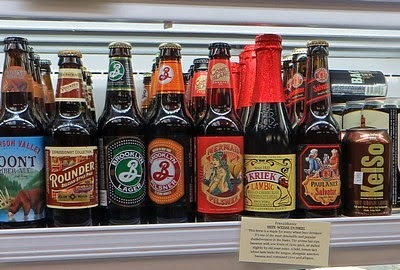 Most mass market American beers are made in the Pilsner style. Some, like Budweiser, have a forward hop flavor while others, like Coors, have a more subdued one. For a food pairing I decided on something less spicy than the bánh mì I had with "Seas the Day." I chose a "Smokin' Henry" from our local deli, Lassen & Hennigs. It's made with smoked turkey, Black Forest ham, cheddar, bacon, lettuce, tomato, and Russian dressing. For a bit of spice, I had some of Trader Joe's cheddar and horseradish flavored chips on the side. While I was waiting for my sandwich to be made, I took a look at Lassen & Hennigs' beer selection, and saw Mermaid Pilsner among their offerings. The beer has a rich golden color, a shade darker than most American Pilsners, but similar to that of Pilsner Urquell, the original Pilsner from Plzeň. The head was moderate, creamy, and fairly long-lasting. The aroma was hoppy, with slight malt undertones and jasmine-like overtones. The flavor was a well balanced blend of hop bitterness and malt warmth, with a suggestion of spice and a pleasant, melon like finish. The beer worked well with the flavorful food, but would also be enjoyable on its own. Unlike Czech or German Pilsners, which adhere to a purity law that allows only the use of barley malt, Mermaid Pilsner, like "Seas the Day," is made with a combination of malts. There is regular two-row barley malt, the staple of most fine beers, along with Cargill's "EuroPils," also made from two-row barley, but with a distinctive "grassy" flavor. There are also two non-barley malts: rye and wheat. It's the rye that imparts the hint of spiciness. Mermaid Pilsner takes its name from Mermaid Avenue, one of Coney Island's main thoroughfares, and from the Mermaid Parade, an annual Coney Island event. This is a well made and thoroughly enjoyable beer, equal to most and better than many imports and American craft-brewed Pilsners. Carioca Joe and Donald Duck, Aquarela do Brasil. Just as we're bracing for another snowstorm, a friend in Chicago(!) sends me this.